Just checking in to post a quick update on my Search Engine Optimisation (SEO) Keyword Performance for the website you are viewing now. As you quite likely know; I’ve been using the online Positionly SEO software to monitor how well my website is performing in Search Engines like Google, and I hope that by posting occasional updates on my average rank chart, I should hopefully be able to look back on my progress and see a provable track record. In the past couple of months, I have been fine-tuning my keyword selection; to be sure that I am only using keywords which are relevant to the types of traffic I’m hoping to welcome to my website. 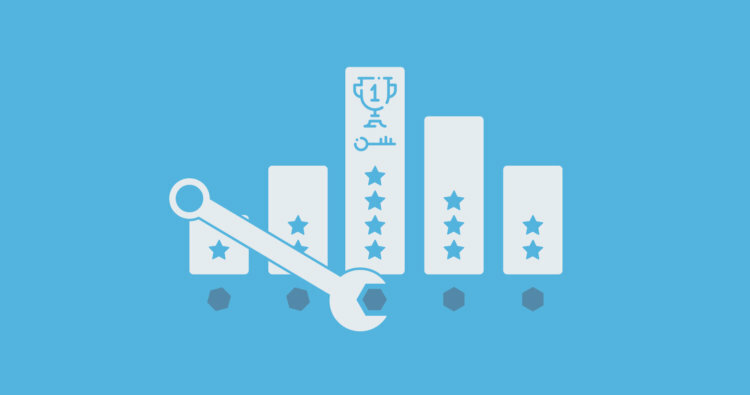 Up until recently, given all the changes I was making, it was hard to measure any realistic progression because the average rank shifted so dramatically when altering the total number of keywords in the list. However, all this changed recently when I decided that I would leave it be for a while and simply monitor the performance to see whether my Search Engine Optimisation was going to be a car crash or a job well done. It seems – and I’m grateful for it – that my overall average page rank, for my specified keywords, is on the climb. I’ve always averaged between 11.0 – 15.0 although now I’m doing pretty well at 10.2! I’m pretty pleased with that. Current average at this moment in time is 10.2 / 101 keywords. You’ll notice in the area circled, the fluctuations have really started to settle down and you can now see a visible climb in my average result listing positions. Happy days, eh? 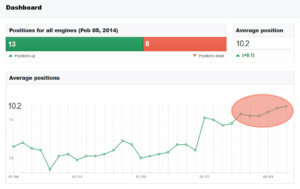 How do you track and monitor your Search Engine Performance? Do you even bother? Let me know in the comments section!